Secretary-General Ban Ki-moon (left) introduces Sigrid Kaag, newly-appointed Special Coordinator of the OPCW-UN Joint Mission on eliminating Syria’s chemical weapons programme. Secretary-General Ban Ki-moon announced the appointment of Sigrid Kaag, of the Netherlands, as Special Coordinator of the joint mission of the Organisation for the Prohibition of Chemical Weapons (OPCW) and the United Nations, which officially began its work today overseeing the destruction of Syria’s chemical stockpiles and production facilities. The UN chief appeared with Ms. Kaag at a news briefing at UN Headquarters in New York, he also announced that the appointment was made in close consultations with OPCW Director-General Ahmet Üzümcü. Ms. Kaag currently works for the UN Development Programme (UNDP) and has previously worked for the world body’s children's agency UNICEF. Ms. Kaag’s role includes ensuring access and security for the OPCW inspectors, as well as logistical, communications, medical, administrative and policy support. She will also have to coordinate the provision of international assistance to complete the elimination of the Syrian chemical weapons programme in accordance with the decisions of the Security Council and OPCW Executive Council. The Joint Mission also announced today that the OPCW and the UN have established separate but complementary Trust Funds. 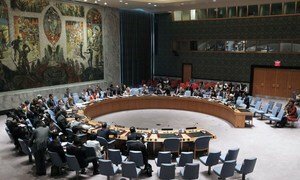 The appointment of the Special Coordinator and the arrangements related to the Trust Funds are based on the recommendations made by Mr. Ban, with the advice and support of Mr. Üzümcü, in accordance with the letter by the Secretary-General to the Presidency of the Security Council earlier this month. The Joint Mission has been established in order to achieve the timely elimination of the Syrian chemical weapons programme in the safest and most secure manner possible, and will continue the work undertaken by an OPCW–UN advance team in Syria since the beginning of this month. In his remarks to the press, Mr. Ban stressed that cooperation of all parties is required, with the situation in Syria still dangerous and unpredictable. “The humanitarian situation is worsening. The statement issued by the President of the Security Council two weeks ago called on all parties to end the violence and stop targeting civilians. It is vital to turn those strong words into action,” he said. Mr. Ban said that efforts to hold the so–called “Geneva II” conference in November, bringing all stakeholders to the negotiating table. In addition, the Joint Special Representative Lakhdar Brahimi will visit the region for consultations with the key parties related to the conference. Meanwhile, UN spokesperson Martin Nesirky said that the joint mission has now conducted verification activities at a total of 11 sites that are identified in Syria’s disclosure. “Activities have also included overseeing the destruction of critical equipment at six sites, as well as some destruction of so-called Category 3 weapons, and that is, in other words, unloaded chemical weapons munitions,” he added.